Did you know that the CBD industry is growing at a faster rate than ever? What this may mean is that there’s going to be a fierce amount of competition between brands and hopefully this challenges CBD companies to become better and produce more high-quality CBD products for us consumers. But with the continued rise of the CBD market, some might still get confused which brands to trust. Here’s one that you may want to consider. Medix CBD takes pride in the quality of their products and their process. All Medix CBD products are extracted from 100% industrial hemp grown in Kentucky, known to have top-notch hemp production in the US. Medix CBD’s products are chemical-free and their processes ensure traceable amounts of THC are removed completely, undergoing extensive lab tests, to confirm their products have 100% pure and natural CBD. Their lab test results are not available online but feel free to request a copy. 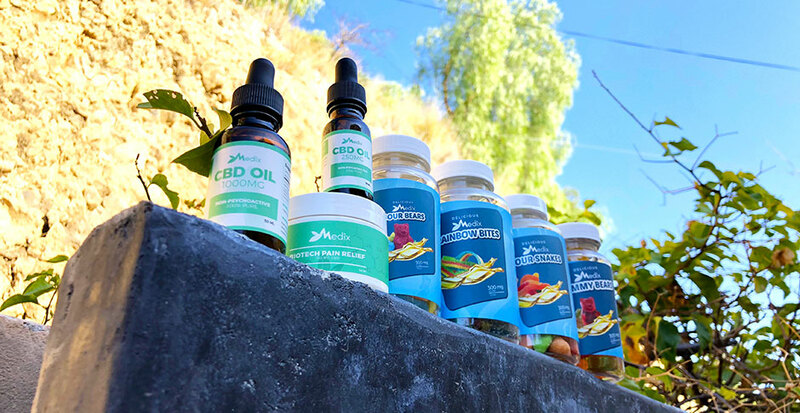 Medix CBD’s delicious CBD edibles come in the form of Sour Snakes, Sour Bears, Gummy Bears, and Rainbow Bites, all infused with premium-grade Phyto-cannabinoid-rich (PCR) hemp oil and has 0% THC. The Sour Snakes and Sour Bears have a layer of sweet and sour sugar crystals. Their delicious, tangy yet sour taste, is something that can make your taste buds tingle with delight. If you’re not fond of the sour bite, you may want to give the regular Gummy bears a try. It’s sweeter and it has great fruity flavors you can enjoy no matter what age you are. However, we want to point out that if you’ve not had CBD-infused gummies before, it’s important to know that they generally do not taste 100% similar to your store-bought gummies. You will find they taste a little different, having some traces of bitterness. But as you chew along, the sweetness and candy flavors start to overpower that. Among us and our testers, the Sour Bears were, hands down, the absolute favorite. In general, all have felt it helped them feel relaxed and sleep better. They also took it for back and hip pains, as well as knee pains. One said the pain went away and felt 0 in the pain scale. She slept like a baby at night and woke up more energized and focused. She has been taking 1 Sour Bear at 6PM every night and the effect is seen 15-30 minutes after. She’s then up and about the next day. The Sour Bear has taken her off her pain meds. The Sour Bear helped with anxiety and ADD for one tester too. She felt generally calmer and more focused. Meanwhile, even having perfect health, some would take these CBD gummies to maintain it. Some even claim it helps them recover from illnesses while lowering the chance of getting future sicknesses, or even to relax and wind down after a hard day’s work. This oral drop is a high-end CBD oil infused with premium-grade CBD-rich hemp oil. The 250mg/15ml CBD hemp oil is a tincture that contains 99.9% pure CBD isolate as well as pure hemp seed oil. It has a faint taste of hemp but if that doesn’t bother you, this quality CBD oil is worth trying. Some testers with diabetes found that taking the CBD oil on a daily basis stabilizes their blood sugar levels. It allowed them to take less artificial medications and have a more organic diet. Some patients suffering from chronic pain said they benefited from the analgesic effects of this product. Its serving size is 1ml and each bottle gets you 15 servings. This product works the same as the CBD oil above, except that it offers four times the strength. Similar to the above, it has a natural hemp flavor and worked for those that have more severe physical pains. Some have lauded it for being easy to swallow. Some CBD oils out there are too thick and thus feel awkward on the throat. This product is safe to consume no matter what age. A tester says that the oil helped them get relief from their lower back pains due to age. They take it every night to become more active at work while having more energy when their grandchildren visit. If ingesting CBD is not for you (or not yet), topicals is usually a great way to start. Medix CBD’s topical cream was formulated for pain relief especially for sore muscles or any areas in the body with pain, even arthritis. The consistency is thick but does not feel sticky. It feels a lot like menthol and gave us a cooling and calming effect. That said though, it does smell like Bengay. But if that doesn’t bother you, the cream works really well in our experience and gave us pain relief for our knee and back pains. Apart from the products above, Medix CBD also have vape oils and CBD oil for dogs. Overall, we give Medix CBD a thumbs up for the great quality and selection of their products that worked for our variety of concerns. They also offer Free US Shipping for orders over $100 and gives a full refund on the purchase price within 30 days if you are not fully satisfied with your purchase. Now that speaks to us about their strong confidence and belief on their own products. You can give Medix CBD a try and feel free to use the coupon code below exclusive for our readers.